© 2019 Mike Meulstee. All rights reserved. 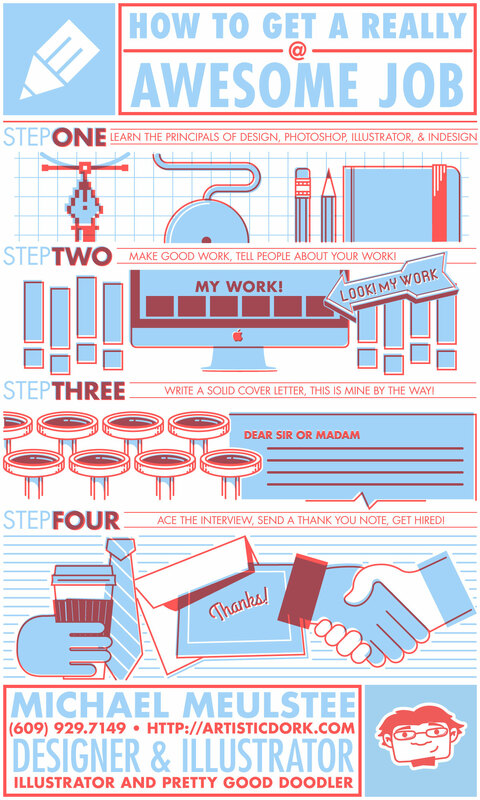 What I did do, was something similar, I created an infographic cover letter. While it wasn’t entirely successful in the purpose of a cover letter, it did start a conversation and show a little glimpse of my skills and outside of the box thinking. I actually still use it today for some of the more laid back and non-traditional roles I’ll apply for. Such as an infographic specific freelance role or something along those lines. Doing something different and interesting has it’s time and place in the job hunt, but at the end of the day, a resume is not the place (unless you’re doing something REALLY different, typically more than pixels on the screen and an email) most people want to see a nicely designed resume but at the end of the day it should still look like a resume. I’d love to hear if you have done something different and it’s been successful. What type of project are you looking to work on? Tell me a bit about your project? Let me know enough to be excited, but not so much that there's nothing left to talk about!